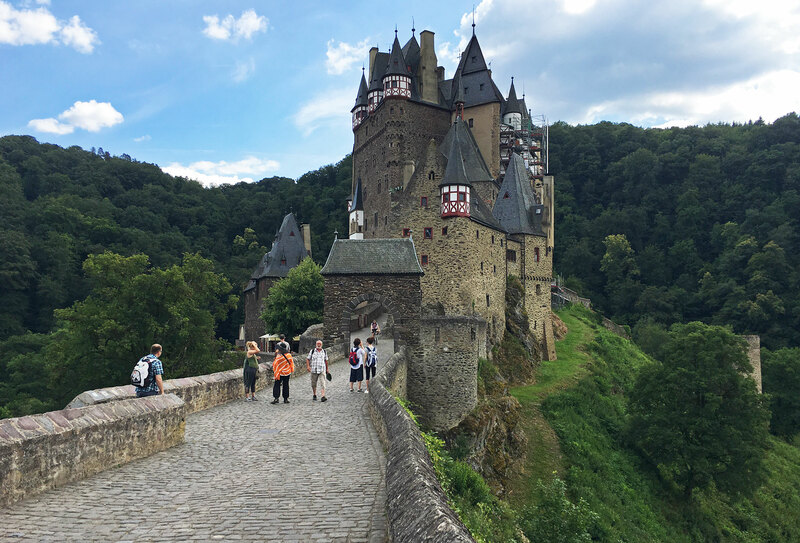 Eltz Castle, Mosel river and valley were the next goals, so remained on a southwestern course. 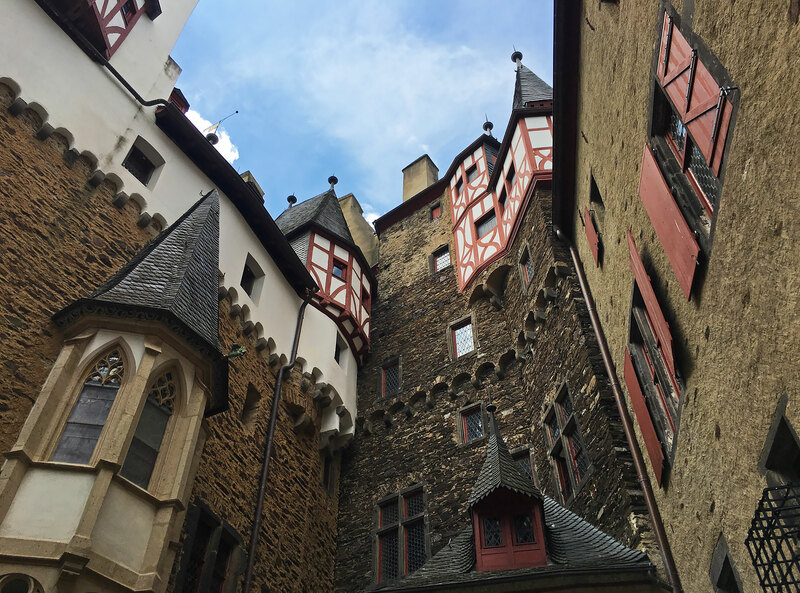 The castle is just 10-15 minutes away from the river Mosel. It was (sort of) planned. 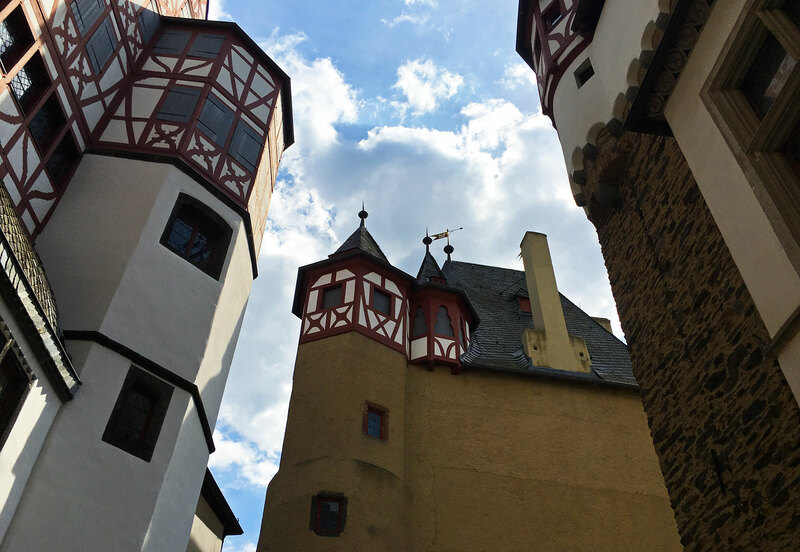 Had read about Eltz Castle (Burg Eltz in German) during spring. It seemed well worth a visit. But those plans were made at a time when the direction was Switzerland, French Alps and a westward oriented adventure. Due to the incident further north in Germany, the Swiss/French adventures were out. I could of course ignore warnings, gamble, and hope to be lucky. Instead, as a temporary solution, decided to postpone decision making for another day. From Höxter I headed southwest on small roads, in direction of Koblenz. The nature and terrain in the region is comprised of farmlands, rolling hills and woods. Riding “smallways style” there’s always surprises. 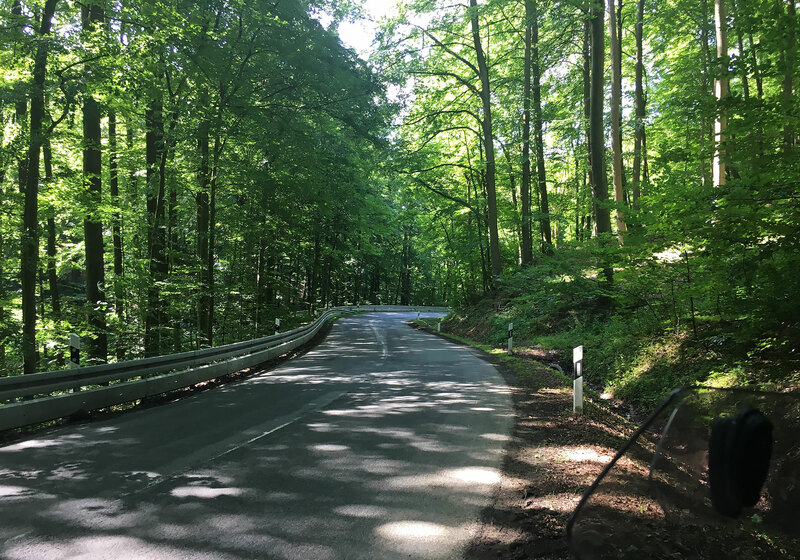 Riding up a wooden hill into a forest, I hit on a cool, twisty road in a “green tunnel”. Had a similar experience in Slovakia last year. Riding such roads with dry pavement is a cool experience. On the wet, not so much. Last year I went through Black forest (Schwarzwald) further south in Germany. The roads were dangerously slippery, the turns especially hazardous. Carrying on I passed through several small towns with long history. 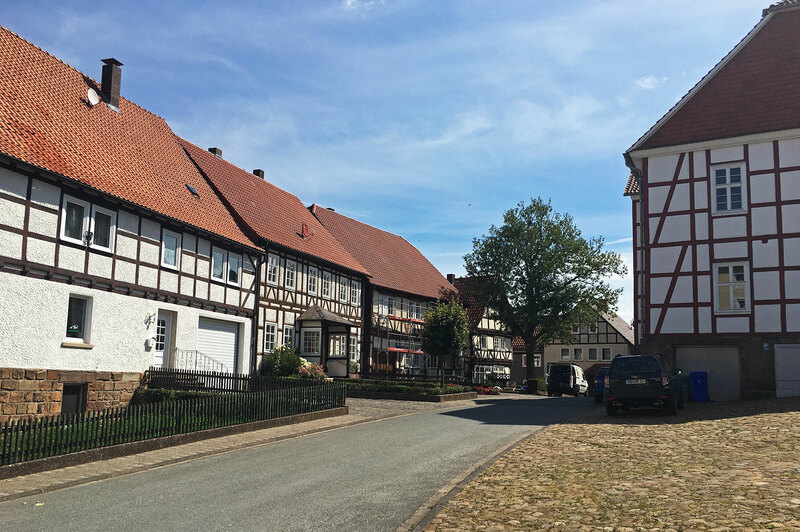 Like the city of Landau near Arolsen. 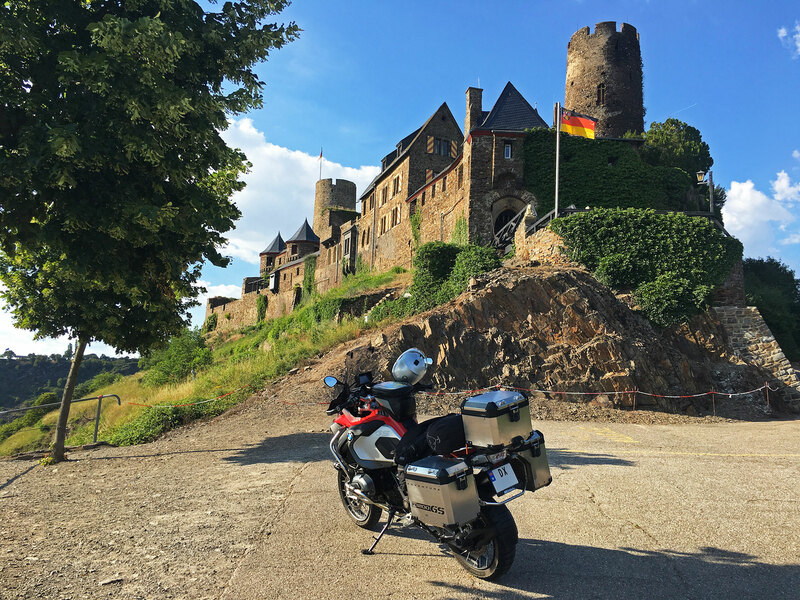 Passing south of Koblenz on BundesStrasse 327 I crossed the river Rhine, and continued southwest. Across some hills the road all of a sudden turned mini-alpine. Sloping down it offered lots of twists, plus a couple of hairpins towards the shores of Mosel river. 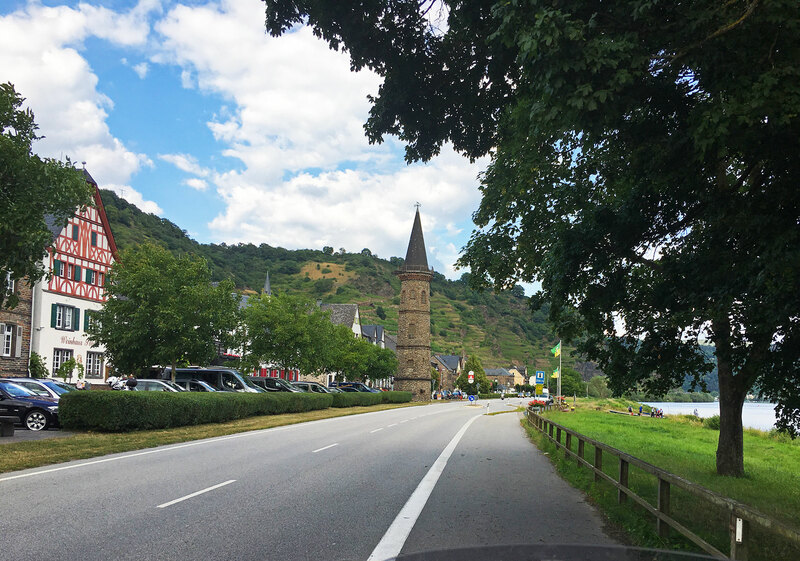 Crossing over to Hatzenport the GPS, set in curvy roads mode, suggested a road up along the Mosel valley slopes. I noticed a rider on a large BMW 1600GT tourer with a passenger heading in the same direction. Passed him on the way up, keen to get to Eltz Castle as it was getting later in the afternoon. I am not among the slowest of riders, some might say quite the opposite. But the BMW1600 rider stuck on my tail, lost ground in the bends, caught up on me on the straights. Obviously someone with experience, doing that with a passenger requires skills! Finally at the parking we both stopped and got into talking. Turned out to be a great guy, on a day trip with his father. Much thanks to him I overcame my security neurosis. He said not to worry, it would be safe. So I left the bike next to his plus several other bikes. With a tank bag full of stash, plus helmet on the handlebars. If I hadn’t there would have been no visit to the castle. Getting from the parking to the castle you have a few options. There’s a shuttle bus, which takes you to the castle gate, you can walk along the road. Or you can take a track through the woods. We did the latter. Walking around 1.5 kilometers in 30+C with boots & full motorcycle gear can, for most, be a sweaty experience. Being slightly downhill, running through a wood, hid under the canopy helped a bit. 15-20 minutes later we came out of the wood, and were rewarded with this. Scaffolding on the north side of the castle failed to diminish the impression. It looked almost as out of a fairy tale, reflecting periodic history. Further up we hit on a cobblestone road, leading to the castle gate. Despite heat and being in full gear it was an awesome experience. The temperature fell pleasantly as we entered the castle courtyard. Where the family building sections and plural architectural aspects of the castle unfolded. Eltz Castle family buildings, seen from the inner courtyard. The courtyard is pretty narrow, sectioned in different levels. With different family and family part sections towering on all sides. 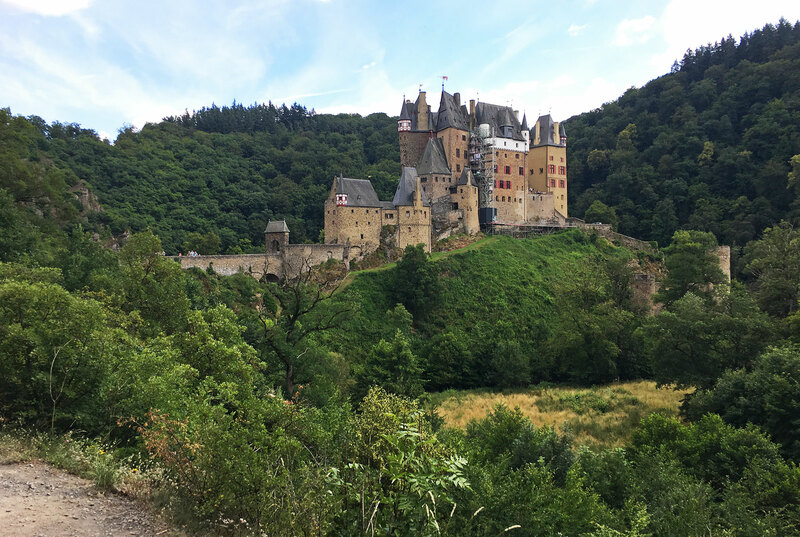 If you’re interested in the history behind Eltz Castle, check out Wikipedia. Right outside the inner courtyard you can find toilets, and a cafè offering all sorts of refreshments and food. We sat down to have a beer, and then headed back to the parking. I was getting a bit nervous again admittedly. Arriving here all was in order, nothing stolen or missing, thankfully. I departed from my companions and headed down the same way I came up, or almost. Afternoon transited into early evening. 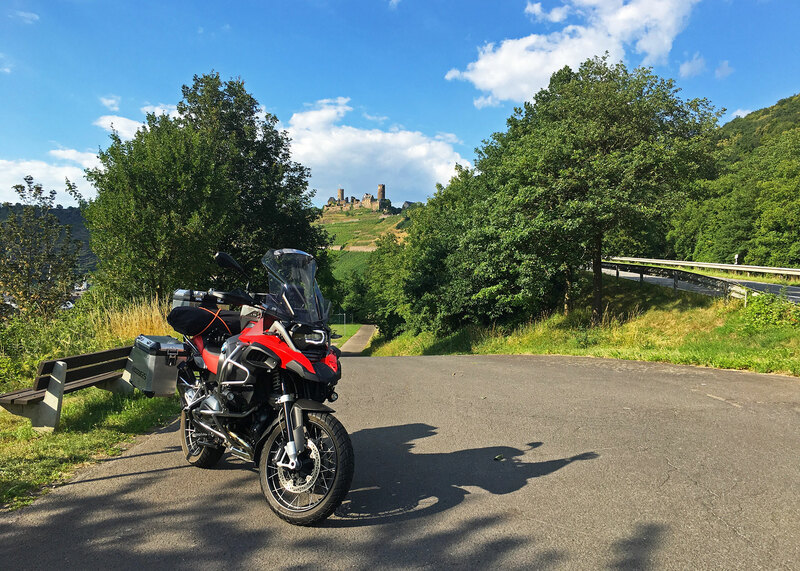 Riding up along the Mosel river I saw another castle, Burg Thurant. Since not yet decided on where to stay decided to check ut out. So crossed the river and rode up on the other side. Being early in the evening the castle was closed. So made a quick stop to take some pics. Checked booking.com for accommodation nearby. Sometimes that is the cheaper option, as they have special deals from time to time. Found a hotel that looked decent for ditto decent money. Booked it, then headed back down to the riverside. 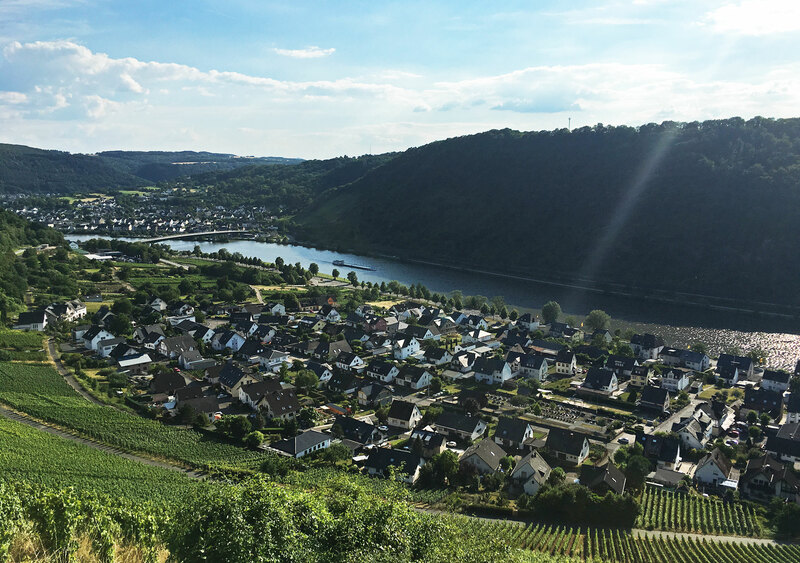 From Thurant Castle, Mosel river with Alken below, Löf in the rear. Might be back to see Thurant Castle one day. I’ve planned to dedicate one summers adventure to western Switzerland & Swiss Alpine roads, French Alps and parts of France. So I’ll be going in this direction, one day! Back through Löf and up on the other side I found my hotel for the night. A somewhat stylish spa hotel as it turned out. Didn’t bother me the least bit. Bothered me even less that the hotel’s restaurant served great food, local beers & wine, plus had an awesome deck, overlooking Mosel valley. 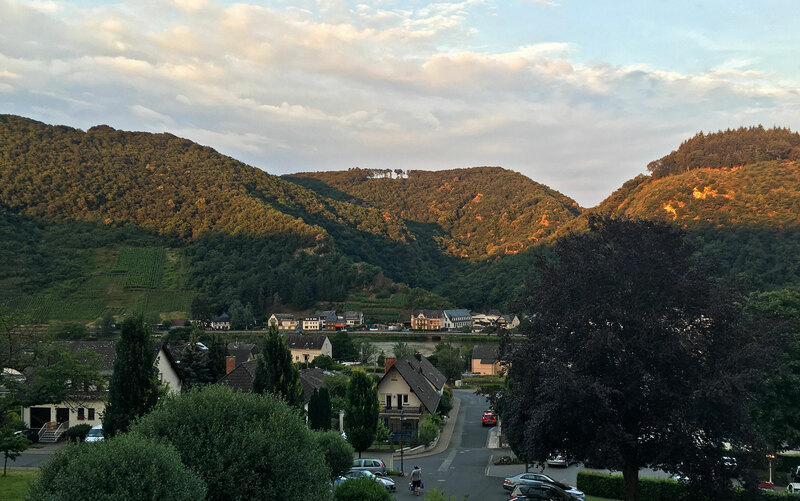 Sundown over the Mosel valley hills. And thus ended an eventful day. The next morning I had some new decisions to make, whereto and in what direction? 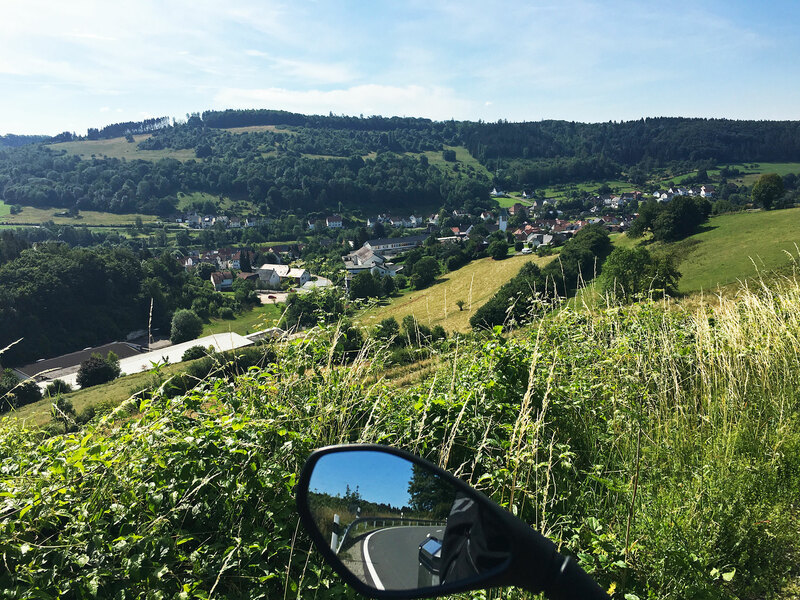 This entry was posted in MC rides, trips & adventures and tagged Adventure, Germany, History, MC riding, Vacation. Bookmark the permalink.